If you like stories about dinosaurs, you'll probably want to learn about the other titans of their age -- mammoths and mastodons, these unusual ancestors of modern mammals. Yes, they look like elephants but are they from the same family? To find out we have to study these animals. One way is to examine their remains, mostly bones.We'll never really know what dinosaurs looked like or how they lived. Dinosaurs fossils re relatively rare, and fossil hunters almost never find skin or flesh with the bones. In addition modern reptiles are so different from their extinct relatives that it's hard to make comparisons. However, the story with mammoths is different. Their remains are plentiful, and frozen remains often include skin, hair, and internal organs. 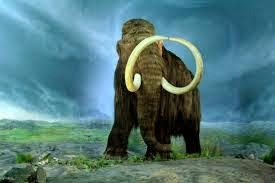 And there is more -- the mammoths are very closely related to their surviving relatives-the elephants. Here you can find some questions about mammoths and a link which answers them all. Do this WebQuest and find out more about these amazing animals.